recording their genealogy. The workshop is being taken by Jan Gow. Where: Masonic Hall, Tararua Street, Paraparaumu (on the east of the railway line). If lost on the day please ring Gerald Twiss on 021 151 6714. Cost: $8.00 for each session, or $20.00 if you attend all three sessions Bring your own lunch. Tea and coffee will be provided. Handouts prepared by Jan will be available to buy (at a good price) to those who wish to purchase them. Please confirm your attendance by e-mailing gero@ihug.co.nz and we would appreciate it if you would kindly advise gero@ihug.co.nz which sessions you will be attending. Auckland: 25 February 2006, 27 May 2006, 26 August 2006 and 25 November 2006. Anoher day being investigated, probably Sunday - watch this space. Kapiti tba. Pass this invitation on to others, including those who are not yet users. 1 A group has been meeting four times a year in Auckland since 29 October 2000. The Convenor is Jan Gow and she can be contacted at 09 521 1518 or email jangow@genealogy.net.nz with LUG meeting as the subject. Meetings will be on the fourth Saturday in the months of February, May, August and November. The Auckland and Kapiti groups are "informal" and anyone can attend the meetings, with door charges rather than subscriptions. The Legacy Users NZ email circulation is available for any and all such group, with the users on a national rather than regional basis. If anyone else is interested in participating in a regional/local group let me know and I will see if there are others. BISMARCK - Family researchers in North Dakota and beyond are now able to also access the state's death index online, thanks to the worldwide reach of the Internet. Prior to its online launch earlier this month, the state's death index was only available at the State Archives and Historical Research Library (SAHRL) at the North Dakota Heritage Center in Bismarck. The index supplies the individual's full name, date of birth (if known), date of death, county of residence and county of death. It supplements the publication, North Dakota Necrology, 1920-1926, and the obituary and death notices found in the newspaper abstract file in the SAHRL at the North Dakota Heritage Center. The time period covered in the death index is January 1, 1881 through October 31, 2005, with monthly updates. The website is maintained by the North Dakota Department of Health's Division of Vital Statistics. Many early deaths were not recorded, and there are very few deaths listed in the index prior to 1900. The death index website's address is https://secure.apps.state.nd.us/doh/certificates/deathCertSearch.htm . The website is the result of an 18-month project by a committee composed of staff from the State Historical Society of North Dakota, the North Dakota State Genealogical Society (NDSGS) and the North Dakota Department of Health's Division of Vital Statistics. The website was made possible by funding and support provided by the NDSGS, which received an initial grant of $1000 from the North Dakota Community Foundation. The NDSGS was then able to raise more than $2000 in matching funds/donations from other genealogical societies and genealogists from North Dakota and other states. Additional information about the NDSGS is available by visiting their website at www.rootsweb.com/~ndsgs/index.html. For more information about the State Historical Society of North Dakota, visit its website at www.nd.gov/hist or call the North Dakota Heritage Center at (701) 328-2666. To view past updates, click here. • While on the Family View, right-click on the background between the boxes. A shortcut menu appears with options to Change Color Scheme, Change Family File, Split Screen View, and Close this View. While on the Pedigree View the menu contains the above plus Toggle Display of 4/5 Generations and Zoom Lists. • Right-click on the large rectangle in the Husband box on the Family View. The menu contains Edit (name), Edit Marriage, Add, View, Notes, Pictures, Tag, Delete, and Unlink. All these options are available from one place. You don't have to go searching through all the menus on the menu bar or help screens trying to figure out how to do something. • Right-click on a child name in the child list. The shortcut menu contains Edit (name), Add Brother, Add Sister, Notes, Pictures, Tag, Set to Preferred Child, Children's Settings, View, Delete and Unlink from Parents. Many windows have right-click menus (for instance the Picture Gallery). If in doubt, try right-clicking on something! Right-click menus will help you save time and make working in Legacy much easier and more efficient. Everyone believes in it until their children act like fools. . . .
El Dorado Springs, MO – November 8, 2005 – Pocket Genealogist was awarded the prestigious itle of Best Genealogy Software for the second year in a row by Smartphone & Pocket PC Magazine (formerly Pocket PC Magazine). Pocket Genealogist, a product of Northern Hills Software LLC, is the leader in genealogy software for Pocket PCs and other Windows-Powered mobile devices. With Pocket Genealogist, you can keep your key genealogy facts at your fingertips and leave the bulky laptop at home. Most data types are supported, including events, facts, notes, sources, repositories, addresses, to-do lists, and LDS Ordinances. Smartphone & Pocket PC magazine’s New Products Editor, Diane Dumas, and the Board of Expert judges spent two months selecting 768 award nominees. The Board of Experts who helped select the nominations and then voted for winners are from all over the world. They run prominent Web Sites, serve as Microsoft MVPs, and write for Smartphone & Pocket PC magazine and other organizations. These are all volunteers and none are permanent employees of Smartphone & Pocket PC magazine. Northern Hills Software LLC, a Missouri company, released the first version of Pocket Genealogist in 2000. Since then Pocket Genealogist has become the world leader in handheld genealogy software with registered users in 50 countries. 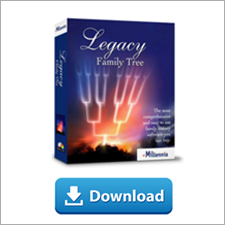 Offering the most extensive data support available in a handheld genealogy program, Pocket Genealogist is extensively tested for compatibility with popular desktop genealogy programs and superior data import. Bi-monthly Smartphone & Pocket PC magazine is a print and multi-digital publication dedicated to users of Windows Mobile PDA’s and Smartphone devices. Each issue includes hardware and software reviews, user profiles, practical tips, plus an “Enterprise Solutions” supplement. Its companion Web site, www.PocketPCmag.com, is updated each day with news, hot downloads, Web sites, reviews, and tips; and also contains archives, a directory of the best Windows Mobile Web sites, and an Encyclopedia of 3600 third-party software and accessories products at http://www.PocketPCmag.com/encyclopedia.asp. Learn more about Pocket Genealogist by clicking here. Learn something new every day with the Genealogy Daily desk calendar. The calendar is 4"x5", and provides state trivia, document recognition, crosswords, census tips, brick wall solutions, genealogy terms, and more. Authored by Millennia's Geoff Rasmussen, it makes a great gift for the genealogy enthusiast or beginner. The Genealogical Publishing Company raves, "Elizabeth Shown Mills' stunning book, Evidence!, provides the family history researcher with a reliable standard for both the correct form of source citation and the sound analysis of evidence. In successful genealogical research, these two practices are inseparable, and the author's treatment of this little-understood concept is nothing short of brilliant. A practical guide to basic principles of family research- this is a book the beginner can understand and the experienced will appreciate. 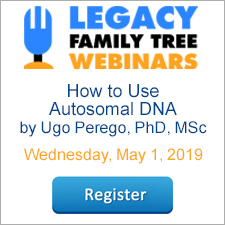 Subjects include but not limited to why, how to, documentation and jump starting your genealogy. A must for every serious student of family history. Valued at US $85.00. Was $39.95. Now just $29.95 until December 31, 2005. I have been attending regional and national genealogy conferences for nearly twenty years. In recent years, I have also attended conferences in England and Canada. I have seen some very successful events and a few that were less so. I don't claim to be an expert on genealogy events but I do see a few trends. In my travels and in e-mail messages, I see and hear comments about how genealogy interest must be declining nationwide because the national conferences are attracting fewer and fewer people every year. More than a decade ago, I attended a National Genealogical Society conference that had 2,800 attendees. Most of the other NGS conferences attracted 2,000 to 2,400 attendees in those days. In the past two or three years, the same conference has struggled to attract 1,500 attendees. Indeed, lower attendance at national conferences might suggest lower interest in genealogy. However, I also see contradictory evidence. I attend several regional events every year and hear about still others. The attendance at regional events is variable. Some regional conferences are reporting reduced attendance while others have the opposite experience. The last New England Regional Genealogical Conference held in Portland, Maine, attracted more than 700 people, the largest crowd ever at this event and nearly as many as some of the national events. This was for an event that focuses on genealogy in a small, six-state area. A first-ever event aimed at genealogy novices held in the small city (56,000 population) of Saint George, Utah, early this year attracted throngs of people. Regional conferences in Ohio, California, Ontario, and elsewhere each attract hundreds of attendees every year. The Ontario (Canada) Genealogical Society typically attracts more than 400 people to its annual conference, not bad for an event that is devoted to genealogy research in only one province. Genealogy cruises have been around for years but seem to be experiencing recent growth in popularity. The Genealogy Conference and Cruise sponsored by Wholly Genes Software sold out in less than twenty-four hours. The organizers went back to the cruise line and asked for more rooms. Four hundred fifty genealogists eventually made it on board, and more were disappointed when they were unable to obtain rooms on this fully-booked cruise. Had more rooms been available, this cruise might have been as big as some of the national genealogy events. I don't have attendance figures on the recent Legacy Genealogy Cruise sponsored by Millennia Software, but I know they also had a crowd. Millennia Software has had several cruises in past years, and all have been quite popular. I understand the Millennia folks plan to hold a genealogy-themed cruise every year because of their past successes. Another fact of interest is that genealogy is reported to be the second or third most popular topic on the web. Does this sound like interest in genealogy is declining? Or is it simply a symptom of a different problem: the possibility that traditional national genealogy conferences are no longer attracting genealogists like they used to? I will suggest that the second answer is closer to the truth. The big annual conferences continue to decline in popularity in spite of a demonstrated increase in the number of genealogists who will spend money to attend genealogy events. Why is this? Based on informal discussions with hundreds of conference and cruise attendees, I believe it boils down to two things: money and enjoyment. Let's face it: traveling to a four-day conference is becoming very expensive. Hotel rooms near most conference sites are running $125 and up per night in these days. Let's hope the National Genealogical Society can negotiate good prices for the conference hotel at their next conference in Chicago. As I write these words, the O'Hare Hyatt Regency's web site is listing their lowest-priced rooms during the conference at $199 per night for Tuesday, Wednesday, and Thursday nights with the same rooms available at $119 per night on Friday and Saturday nights. Those are regular rates, not conference rates. At the regular rates, the hotel bill for the five-night stay would be $835 before various city and state taxes are added. The total will probably be well over $900 after taxes. I am sure the conference organizers can obtain a discount rate, but I bet it will still cost $600 or $700 to stay in the hotel for five nights. Now add in conference admission of around $200 or so, and then add in more money for meals. If an attendee wishes to attend the conference banquet and several sponsored lunches, he or she must add in another $40 to perhaps $150. For anyone planning to travel to the 2006 NGS annual national conference in Chicago, attend the banquet and a few lunches, and stay in a single room, the total expenses could be well over $1,000 plus airfare. Of course, attendees can save money by sharing a hotel room, and I suspect that many people will do just that. Even so, expenses typically will be $700 or more for most people. That calculates out as $175 to perhaps $300 per day. Compare that to the cruises: the recent Legacy Genealogy Cruise cost each attendee as little as $517 (double occupancy) plus roundtrip airfare to Miami. The Wholly Genes Cruise attendees paid as little as $935 per person (double occupancy) plus roundtrip airfare to Tampa. Both cruises included all meals in those prices, and that was for a seven-day event! Even throwing in the airfare, the expense averages about $100 to $150 per day. Airfare runs $200 to $500 roundtrip, depending on the distance to be covered. Of course, airfare is required for most attendees of conferences and cruises alike. Which would you rather attend: an expensive four-day genealogy session in Chicago or a less expensive seven-day genealogy cruise in the Caribbean, stopping at exotic ports of call? In short, this suggests that genealogy is as popular as ever, but genealogists are spending their money differently. Cruises are becoming much more popular in genealogy and elsewhere. This popularity for one form of genealogy event is cutting into attendance at other, expensive events as genealogists are carefully planning their expenditures for major events. When looking at regional events, there are similar differentials in prices and material available. These are typically two- or three-day events, held in smaller cities with lower hotel and restaurant expenses. The admission fees for the regional events are also much cheaper. Attending a three-day regional event typically costs each attendee a few hundred dollars for admission, hotels, meals, and transportation. Again, I will ask the same questions that I asked earlier: Does this sound like the interest in genealogy is declining? Or is it a symptom of the possibility that traditional genealogy conferences are no longer attracting genealogists like they used to? The organizers of the national conferences are facing a huge challenge: how to attract attendees in the face of ever-increasing expenses? I do not envy the organizers as their options are limited. However, I will suggest that it is time to focus on reducing expenses more than on adding more seminars and services. If prices continue to rise, attendance certainly will decline still further. Personally, I am hoping to attend another cruise next year.